Technology these days, huh? One step forward, two steps back. This irony of modern technology is a lot more apparent with phones. While we do enjoy such privileges, they can get rather… unhealthy for us especially if we rely on them too much. 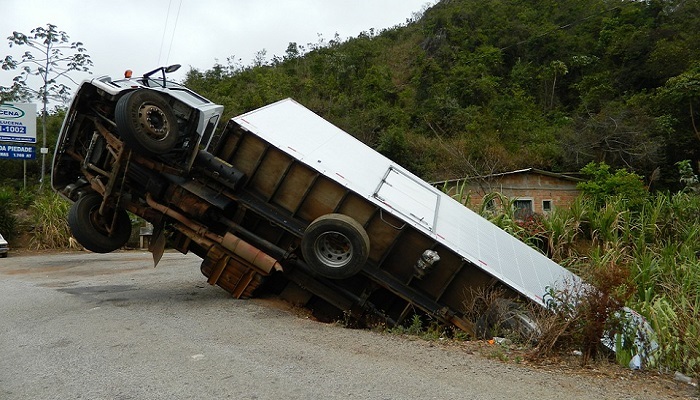 One truck driver even nearly died after Google Maps tells him to drive off a cliff. The incident happened in Indonesia to 23-year-old Agus Tri Pamungkas. Agus was a truck driver and we all know how hard a trucker’s life can be, there are even reality shows dedicated to them. During one of his trips, commandeering a truck loaded with rocks, Agus was having difficulty finding his way in the Indonesian town of Singakerta village in Ubud, Bali. No problem, right? There’s always Google Maps, and that’s what Agus resorted to in order to get directions to the village. However, Agus started to suspect that the route Google Maps recommended to him might have been wrong. He was led to a rocky and damaged uphill road which kept getting narrower. Agus even considered turning back but could not since the road was already too narrow. During the ordeal, the truck stalled and the engine suddenly stopped since it was bearing a heavy load and the road was too steep and narrow. This sent the truck and Agus crashing down to a river below the cliff he was driving on. Thankfully, Agus was safe but suffered some bruises. The villagers had to cut through some thick foliage and overgrowth just to rescue him. “When he got to a bridge, he considered turning back, but because the road was not more than 3 meters [wide], he couldn’t turn around,” recalled a nearby village guard. Apparently, the said road was only traversable with motorcycles and a sign that says so has been placed on the road following the accident.